HOMESTEAD, Fla. — The waters of Biscayne Bay are crystal clear and hold 10,000 years of history. Visitors to Biscayne, the northernmost area of the Florida Keys, can experience the wonders of this turquoise paradise in many ways, ranging from exploring the coral reef, kayaking down the waterways, or simply lounging on the white sands of the islands to enjoy the stunning views. Just take a short trip to Biscayne National Park. 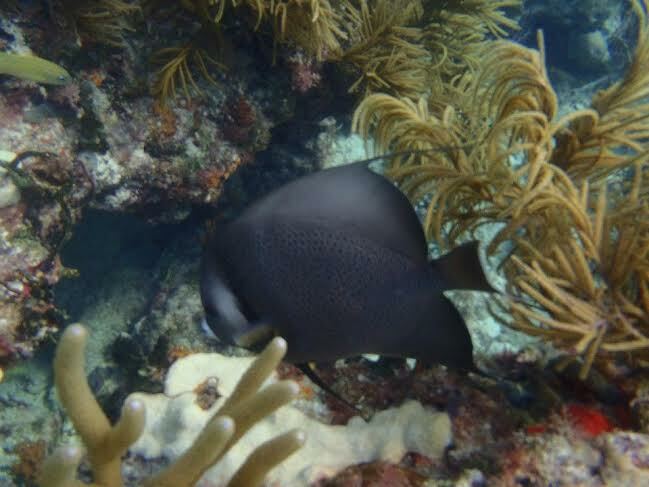 To truly get the most out of Biscayne Bay, putting on a scuba mask and fins will do the trick. Four distinct ecosystems exist within Biscayne Bay and can be seen during one single visit. Pelicans graze the beaches, while manatees relax in the shallow waters along with hundreds of species of colorful fish. Most of the plants seen beneath the waters in Biscayne Bay will not be found anywhere else in the United States and they sway back and forth with the current giving the appearance of a bustling city underwater. Plants sway with the current in the coral reef (Photo by Marcus Lim). My visit to Biscayne National Park was an underwater adventure that started with boarding a boat at the dock in Key Biscayne and riding over to Elliott Key. Turquoise waves crashed against the bow of the boat while we anticipated the magical experience that waited beneath us. Once anchored a short distance from the coral reef in Elliott Key, I quickly slipped on flippers and a scuba mask, jumping off the side of the boat into the brisk water. 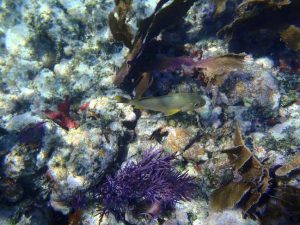 I marveled at the world below me, as fish of all difference sizes, shape, and vibrant colors quickly swam beside me, alarmed by my presence in their kingdom. The colors of the ocean floor in Biscayne Bay, Biscayne National Park (Photo by Marcus Lim). I slowly came up for air, forgetting about the world above me and feeling a slight burn on my back from the sun. It was an extremely hot day, but there wasn’t a cloud in the sky causing the water to be a perfect shade of blue. My group made sure to be extremely cautious when exploring the reef, as it has been well preserved for so many years. 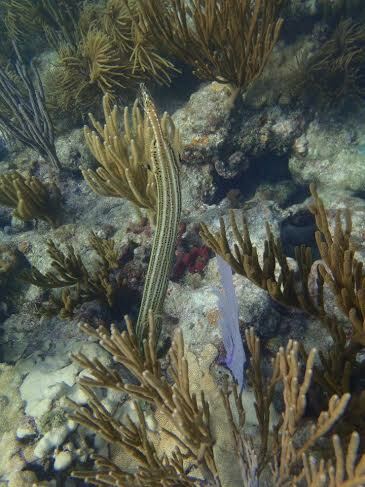 This marvel underwater is not just a sight for tourists; it is a home to the many animals and plants of Biscayne Bay. Biscayne Bay is made up of 173,000 acres that are mostly submerged, making one of the world’s longest coral reef tracts that has been a visitor attraction for many years. After a short break, I dove back into the blue waters to continue exploring before sundown to catch a glimpse of other mysterious sea creatures. Luckily we were able to spot a large green turtle with its flippers outstretched, gliding along the water with the current, paying no mind to the flippers aimlessly splashing around him. A large fish swims along the reef with the current (Photo by Marcus Lim). We all watched in awe as the spotted turtle made its way past us, on its way to the next destination along the reef. Starfish lay motionless, but beautiful and mesmerizing in my brief moment of passing. My group did not have a guide to point out specific plants or species names, allowing me to use my imagination making for a unique underwater experience. Unfortunately, as the sun began to set, we returned to the dock to retire our flippers. With pruned fingers, I made my way back to the boat and, reluctantly, rode back to shore. Despite this, I know that I can easily return to Biscayne Bay and behold the magic and beauty that has yet to be seen. There are many ways to experience Biscayne Bay, including hiking, biking, and camping, although the real wonders lie deep beneath the surface. 4000 Crandon Blvd., Key Biscayne Fla.